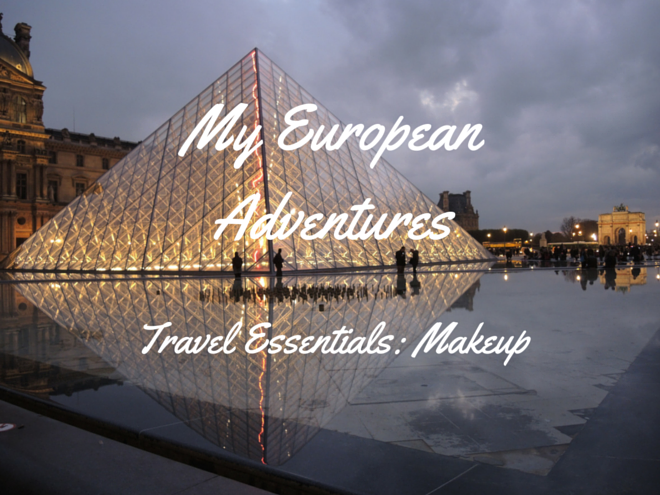 I own a lot of makeup and I tend to mix up the products I use everyday which isn’t practical for travel, so I have edited down the products I am taking with me on my trip. 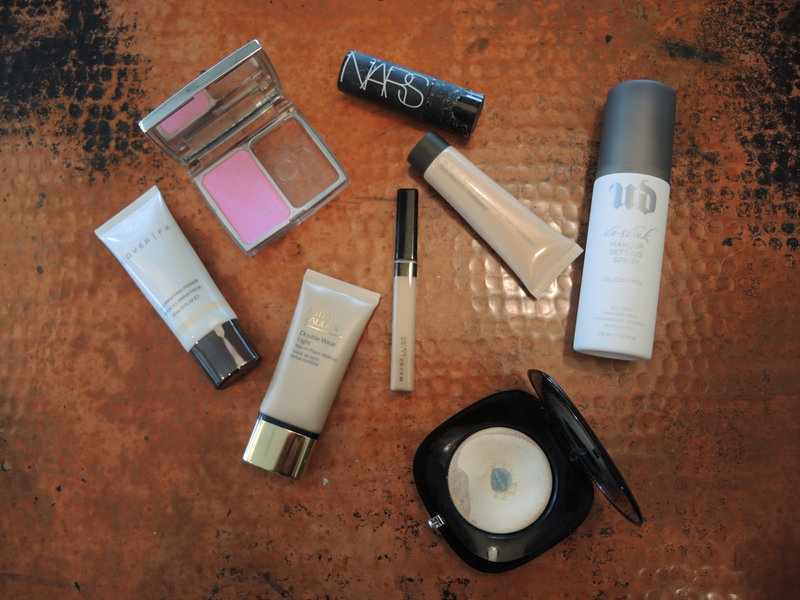 The products I chose were based on quality, ease of use, and ones that need as little tools and touchups as possible. 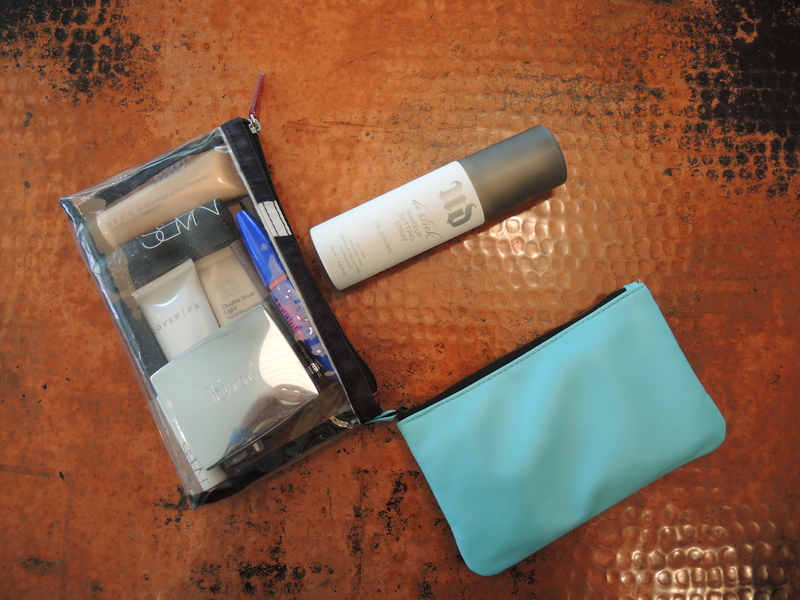 It took me a while but I narrowed down my products enough to fit into two compact pouches. For primer I am taking Cover FX’s Illuminating Primer ($38) which is my favorite at the moment. I apply this all over the face with my fingertips and I love it because it adds a beautiful glow to the skin that when paired with foundation looks completely natural. 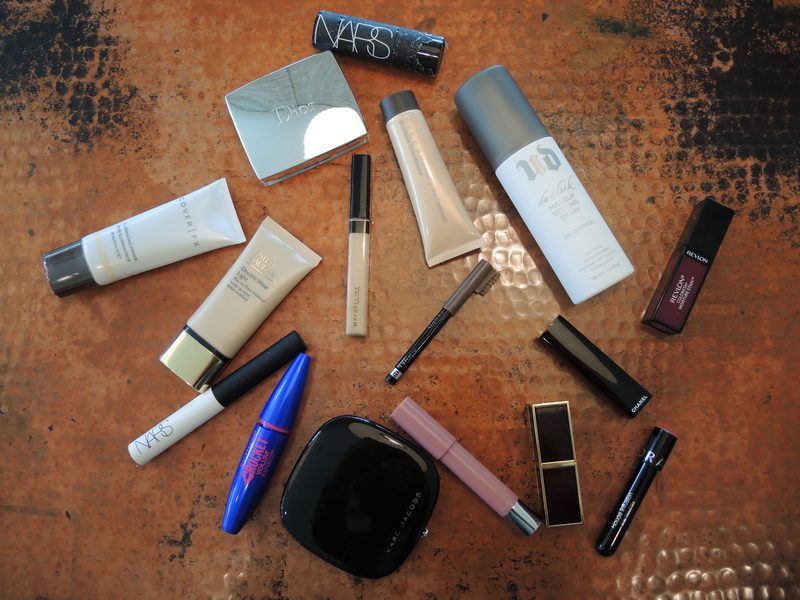 It also does a great job of helping makeup to last longer, so win win! For foundation I am taking Estée Lauder’s Double Wear Light in shade 1.0 ($38), this is my favorite foundation because it lasts most of the day without touchups, looks natural (but still has decent coverage), and is easy to blend. Definitely a good product to look into if you have oily skin or want something that lasts most of the day without touchups. For concealer I am taking Maybelline’s Fit Me Concealer in shade 10 ($5.48) which is a product I hear about all the time but didn’t purchase until a month ago, and let me tell you boy was I missing out. I am completely baffled that such an inexpensive product could cover and blend so well. If you haven’t tried this already I highly suggest you do. 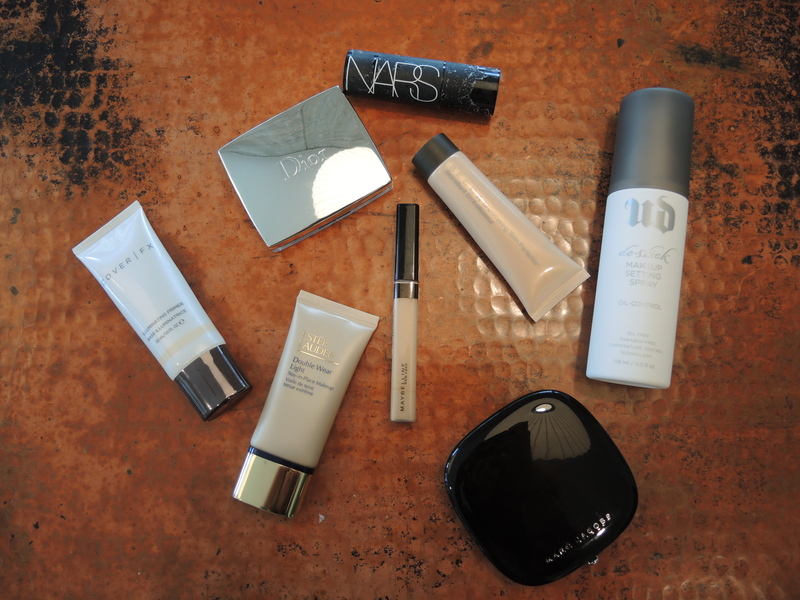 I am taking Nars’ Matte Multiple in shade Altai ($39) to use for contouring. This product somehow ended up forgotten in the back of a drawer for months until recently, and I can’t believe I stopped using it for so long. I find the cream blends a lot better than most powders and looks far more natural on the skin, and best of all application is dead simple. I tend to apply it with my fingertips and then blend with a sculpting brush, but blending with fingers would work just as well. For highlighter I am taking Becca’s Shimmering Skin Perfector in shade Moonstone ($19 for size pictured) which is my favorite liquid highlighter. It adds a beautiful believable glow to the skin and blends out perfectly with a Beauty Blender ($20) or with fingertips. For blush I am taking Dior’s Rosy Glow Blush in shade 001 Petal ($44). I love this blush because it gives the cheeks a bright flush similar to how the skin looks after being outside on a cold winter’s day. To set makeup I am taking Urban Decay’s De-Slick Makeup Setting Spray ($30). This comes in a spray bottle and I find it to be the easiest and least fussy way to set makeup. All you have to do is spray it a few times on the face after applying makeup and you’re done. The best part is that your makeup will be shine free for most of the day. In case I need to touchup during the day I am also taking Marc Jacob’s Perfection Powder in shade 100 Finish Line ($48). This is a translucent compact powder that does a great job of soaking up excess oil without leaving a caky finish. I am taking very little eye makeup on this trip because I don’t want to complicate my morning routine with unnecessary steps, especially because I’ll probably end up wearing sunglasses for most of the day. So I am taking only the products I will use on a daily basis. For brows I am taking Rimmel’s Eyebrow Pencil in shade 002 Hazel ($3.59). I almost never leave the house without filling in my brows because I don’t feel right if I don’t have that little extra definition to frame my face. I like the one by Rimmel because it is inexpensive, lasts all day, and looks natural when applied lightly and blended out. I will admit I prefer the Anastasia Brow Wiz ($21), but considering the price difference the one by Rimmel is excellent. 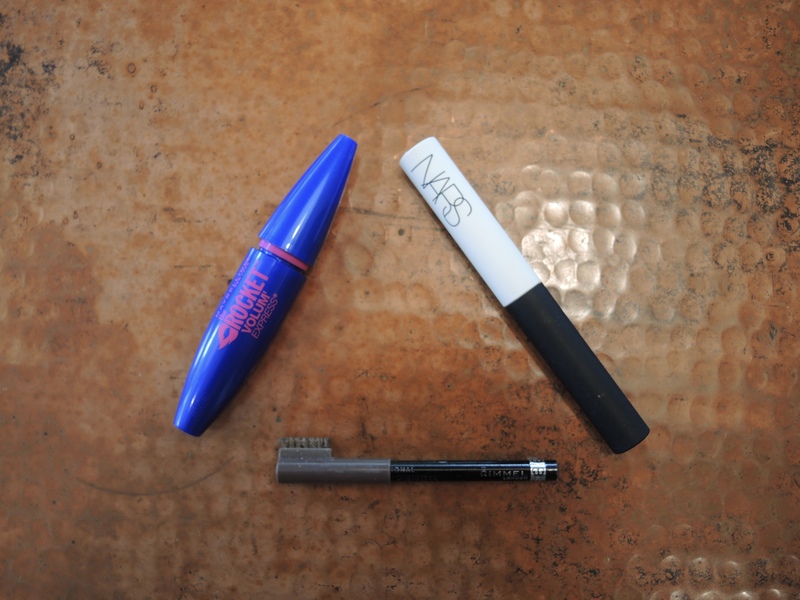 For mascara I am taking Maybelline’s The Rocket Mascara ($8.29). This is my favorite drugstore mascara because it applies easily, adds a lot of volume, and lengthens the lashes. It can also be applied to look natural or really intense so it is easy to mix it up depending on the occasion or the look you’re going for. Just in case I buy some eyeshadow while on my travels I am taking Nars’ Smudge Proof Eyeshadow Base ($25). I never apply eyeshadow without using this base because if I don’t the shadow will crease within a few short hours (not the best look), while when I do apply this my eye makeup stays in place until I take it off at the end of the day. I am taking quite a few lipsticks with me on this trip because I can’t help myself, my addiction is too far gone to even try taking less. For days when I want a low maintenance red lip I am taking Chanel’s Rouge Allure Lip Color in shade 135 Énigmatique ($36). This is a beautiful subtle red that lasts well throughout the day and can be worn with almost any look, making it an essential in my eyes. When I want to have a bold bright lip I will use Tom Ford’s Lip Color in 08 Flamingo ($55), a really bright pink that pairs well with muted colored outfits. For a vampier look I am taking Revlon’s Colorstay Moisture Stain in shade 005 Parisian Passion ($9.99), a deep berry shade that is perfect for fall. For days when I want a more neutral lip that lasts most of the day I am taking Sephora’s Rouge Infusion in shade 19 Peony ($14). I like that this product gives some extra color to my lips without being too intense and that I don’t have to touch up too often during the day. For a more everyday color I am taking Revlon’s Colorburst Balm Stain in shade 001 Honey ($8.99). This is probably my most used lip color because it pairs well with any outfit and isn’t so bold that it seems repetitive to wear on a daily basis. 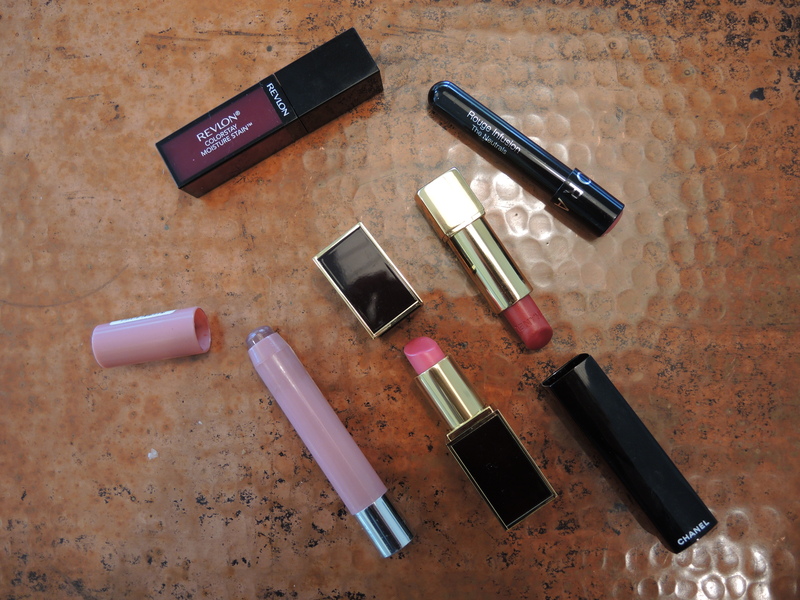 From Left to Right: Revlon Balm Stain, Tom Ford Lip Color, Chanel Rouge Allure, Revlon Moisture Stain, Sephora Rouge Infusion.